Has anyone heard if Binions and the Orleans plan to hold summer series this year? Orleans, yes. Schedule should be announced soon, per 2/6 OrleansPokerRoom tweet. Binion's, don't know. Jerry said to "stay tuned" in a 2/4 tweet. Dog Days of Summer schedules were announced 3/13/17 and 3/9/18 on FB, so if it happens we'll know soon. I'm not too excited about Binion's seeing as they refused to honour their guarantees in the past year so many will be "boycotting". GN has better tournaments and large fields anyways. 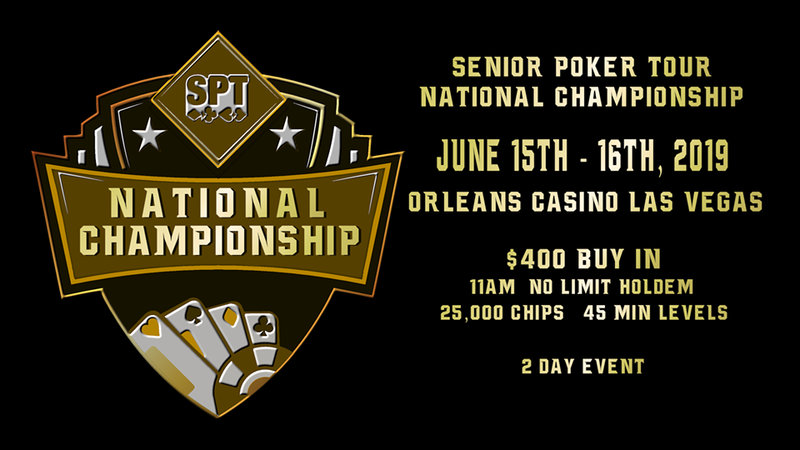 All I've found so far at The Orleans is the Senior Poker Tour June 15-16, 2019. Hopefully their full schedule should be out soon. Not shocked they missed the guarantees (and I assume by a long shot) as that place was dead when I walked in there last summer. Orleans full schedule was out late March last year (definitely by Apr 16 because I have a download with that date). Venetian was March 1 last year. Wynn was March 28. I expect everybody's a little later this year since WSOP was later than last year. You may be required to show receipts proving you played in the tournies. Placed perfectly between the two WSOP senior events. Wynn couldn't have picked much worse days for their PLO events. You shouldn't make up lies about Binions dude. I called and spoke to the head person and he told me they haven't had guarantees in their tournaments in 3 years. Last year he told me the main had 250 players and first place was $60,000 or so. And he said they have the best structures with 60,000 in chips and hour levels. 2 starting days and $1100 buy-in. Sounds like a pretty awesome tournament. In the future stop spreading false information to bring down a pretty nice and affordable tournament series. 2019 Binions NLH Championship 1,100$ ? no Guarantees only last year, and ok the structure is very very good but why this inflation ? Don't think Binions post here, so probably best shooting a question to them on Twitter. Paul used to be pretty good when he was there, which is prob a reason he's now one of one of top dogs at Aria. I have been a little surprised at the larger buy ins for Seniors events at the Venetian and the Wynn. Beyond that, however, I suspect that it is because we are seeing more players over the age of 50 that started playing in the post-Moneymaker era and thus may be in a better financial position or are more accustomed to larger buy-in amounts than some of the Seniors of earlier generations. Entry totals at WSOP have gone up, showing that the current crop of seniors is willing to pay four-figures to enter an event. Binions has $550 and $1100 tourneys daily. Does anyone know if they have a room this year, or if they will attempt to play tournaments on the casino floor, as theyve done the past couole of years? +1 I also believe the properties themselves and the clientele they may attract plays a part. I suspect (Just my opinion) that most houses would see a more significant drop in runners if they tried a 4 figure buy in and do much better in the $500 - $600 cap area.